Caudalie Friends & Family Sale 50% off luxe skincare and free gifts! Plus, new beauty sale and Shiseido gift with purchase at Macy’s, Clinique gift and exclusive Clinique PWP at Bloomingdale’s, Lancome gift with purchase at Bergdorf Goodman and awesome Clinique bonust at Clinique USA. Over 40 GWP updates below! Caudalie Friends and Family has begun. Enjoy 20% OFF the entire site and up to 50% OFF on selected items + FREE shipping until April 16th! No Code Necessary. (NEW) GIFT 2: Enjoy 4 Caudalie skincare minis & travel pouch! Spend $175 or more and use code MINIS175 at checkout! Gift includes Grape Water 75ml, Hand and Nail Cream 30ml, Resveratrol Eye Balm 5ml, French Kiss Innocence, and a Makeup Pouch. Plus enjoy FREE shipping, ends 4/13. (NEW) GIFT 3: Choose 3pc kits with any order at checkout. One promo code per order. Bloomingdales (NEW) GIFT 1: Purchase a Bloomingdale’s-exclusive 4-piece Fresh Start Set for $25.50 with any Clinique iD™ purchase (a $50 value). – Rinse-Off Foaming Cleanser, 1.01 oz. (NEW) GIFT 2: Receive a 6-piece gift with any $40 Clinique purchase. – Take the Day Off Makeup Remover for Lids, Lashes & Lips, 1.01 oz. – Foaming Sonic Facial Soap, 1.01 oz. – Dramatically Different Moisturizing Lotion, 1.01 oz. (NEW) GIFT 3: Receive a Moisture Surge Duo with any $75 Clinique purchase. – New! Moisture Surge Eye 96-Hour, 0.17 oz. – Moisture Surge 72-Hour Auto-Replenishing Hydrator, 0.50 oz. Take $15 off every $150 you spend on almost all beauty purchases at Bloomingdales.com. PLUS, free gifts with purchase from your favorite brands. Offer valid 4/5-4/14. Bluemercury Still available: Bluemercury Beauty in Bloom Event: get a free 13pc gift with any $125 purchase. See what’s in the bag here. Clinique (NEW) Spring Clinique bonus 2019! GIFT 1: Build your free spring gift 7 pieces with any $29 purchase. A $97 total value including full size moisturizer of your choice. (NEW) GIFT 2: Make it a 9-piece gift. Choose a full-size duo with any $45 purchase. * Up to a $126 total value. (NEW) GIFT 3: Spend $65, get a Mint to Be tote use code ALLGIFTS- $161 total value. (NEW) GIFT 4: Choose another free full size gift with any $75 purchase – Up to a $211 value. (NEW) GIFT 5: Spend $45, choose 4pc gift use code: NATURAL or FLIRTY, ends 4/13. Use code FIRST to get 15% off your first purchase. Lime Crime (NEW)(Today Only) offers 50% off Bundles. Macy’s (NEW) runs 48 Hours Beauty Sale. (NEW) $20 OFF YOUR PURCHASE OF $48 OR MORE Use promo code HOUR48 in your shopping bag for extra savings (excludes beauty). (NEW) Try Mario Badescu Seaweed Night Cream with $20 Skincare purchase! (NEW) Try the NEW! Hyaluronic Eye Cream with any $50 moisturizer purchase! (NEW) Receive a Free Plantscription Retinol Night Moisturizer Packatte with any $50 Macys Beauty purchase. (NEW) Receive a free Benefit precisely my brow individual sample with any $50 beauty purchase. (NEW) Free Clarins Double Serum packette with your moisturizer purchase. (NEW) Receive a FREE Clinique Quickliner for Eyes in Intense Ebony with any Moisturizer purchase $28+! (a $14 Value). (NEW) Receive a Complimentary Lancome Genifique 7 Day Challenge Sampler with any $50 Skincare Purchase. (NEW) GIFT 3: Plus, choose your free full-size cleanser with $250 Shiseido purchase. (1d)(VERY HOT) GIFT 1: Choose your FREE Cosmetics Bag with 19 pc. Sampler with any Cosmetics or Women’s Fragrance purchase of $95 or more. (1d) GIFT 2: Receive a FREE 10 pc gift with $65 Clinical Skincare purchase! (1d) GIFT 3: Receive a FREE Toiletry Bag with 11 pc. Sampler with any Men’s Fragrance or Grooming purchase of $95 or more. Algenist (NEW) Enjoy complimentary ELEVATE Advanced Retinol Serum, Travel Size 5 ml with an order of $75+, offered until April 30, 2019. (NEW) Get free deluxe size trio on any $125 purchase. (NEW) Try Genius Vitamin C serum 5ml for $15 + free shipping + $15 credit for full size purchase. April 14. Use code BRIGHT at checkout to receive free standard shipping. After purchasing the Travel Size GENIUS Ultimate Anti-Aging Vitamin C+ Serum, customers will receive by email $15 off a full-size GENIUS Ultimate Anti-Aging Vitamin C+ Serum. Try: Get Free travel size Firming and Lifting Cream ($24 value) with $75+ orders use code SIGNMEUP. Firming and Lifting Neck cream is 50% off. Free shipping on any $50 order and choose 3 free samples on any order. Amazon (NEW) Get up to $4 off coupon for Coppertone sunscreen. Anthropologie (NEW) Limited Time: 20% Off Full-Price Dresses, Skirts & Heels. ARgENTUM Apothecary (NEW) Receive a complimentary 14ml jar of la lune de velours with every purchase. b-glowing b-glowing (NEW) Get 25% off Trending Picks orders $75 or more with code TRENDINGPICKS! Valid 4/11 – 4/17. (NEW) Plus complimentary By Terry 3-piece beauty bundle ($26 Value) with b-glowing orders of $100 or more! Valid 4/11 – 4/17. (NEW) Get 20% off b-glowing orders $60 or more with code 20NOW! Valid 4/11 – 4/17. BeautyHabit (NEW) With your $50 or more SITEWIDE purchase, receive a Tocca Florence Eau de Parfum (14 ml). Apply code: FLORENCE. Biotherm and Biotherm Canada (NEW) Friends & Family Sale and offers: 20% off everything,25% off $80+ orders or 30% off $135+ orders use the code “FRIENDS” at checkout. Offer is valid through Sunday April 21st. Bond No. 9 (NEW) Celebrate Earth Day! Receive an Elegant Refillable Pocket Spray with Any Purchase! Fragrance of your choice. Offer excludes lipstick refills. Cratejoy (NEW) Spring Treat Yourself Flash Sale goes live tonight! The sale runs though 4/15. Use code TREATYOURSELF for 20% off all orders for select boxes. Crabtree & Evelyn (NEW) offers 40% off any $50 purchase use code: FALF40CTAE, ends 4/15. Debenhams UK (NEW) Free gift when you spend £70 on Elizabeth Arden. Your gift includes:- SUPERSTART Skin Renewal Booster, PREVAGE® Anti-Aging Treatment Boosting Cleanser, Plush Up Lip Gelato in Strawberry Sorbet, PREVAGE® Anti-Aging + Intensive Repair Daily Serum, PREVAGE® Anti-Aging Eye Serum. (NEW) Free gift* when you spend £60 on Lancôme. Your gift includes:- Bi Facil 30ml, Miel En Mousse 15 ml, Hypnose mascara 2ml, Lip Lacquer 378 3ml, Lancôme Love pouch. (1d) Free beauty goody bag* worth over £40 when you spend £70 on beauty, skincare & fragrance. (NEW) GIFT 2: Exclusively on Dior.com, receive a complimentary travel size for orders over $100. Choose at checkout. (NEW) GIFT 3: With any purchase, choose up to two complimentary samples. Enjoy complimentary shipping and samples with every order. Elizabeth Arden (NEW) 20% Off with $150 Purchase with code “RENEWAL” . Plus, get a free 8-pc gift with $150 purchase. Plus, get a free Superstart Skin Renewal Booster Deluxe Sample (.17oz) with any $175 purchase use code “BOOST”. FabFitFun (NEW) Use code GOGOGO to get 40% off your first box (pay $29.99 first box). (1d) Use code ALLMINE for $10 off the Spring Box + a Mystery Bundle Valued at $125 from FabFitFun! Forever 21 (NEW) Shop Forever 21: 21% Off $40+ & Free Ship $40 with Code: FRIENDS21. (NEW) Birthday sale: get a free gift use code F21BDAY with $65 order + extra 50% off sale items use code EXTRA50. *Offer available with the purchase of specified Lancôme bundles on johnlewis.com. Subject to availability. While stocks last. Alternative offer available in store. Free shade matching available instore. Valid 11th April 2019 – 28th April 2019. Kiehl’s (NEW) Get 4pc gift with $65 and Kiehl’s water bottle on $100 use code EARTH. Korres (NEW) 20% off any purchase use code: FLASH20, ends 4/14. See Korrest sale page here. See clearance here. Free shipping on any purchase. Creme de La Mer (NEW) Choose 3 deluxe minis with your $150+ purchase. Use code NEW2018 to get $75 off your first purchase of $350 or more, two free samples and free shipping. Lancome (NEW) up to 30% off Beauty Sale. (3d) Spend $60 or more and receive a 7-piece gift (up to a $116 value). Spend $95 or more and enjoy 3 additional samples (up to a $77 value). Valid 4/5-4/19. Lookfantastic US, CA (NEW) Friends and Family sale: 20% off use code FAMILY. MAKE Beauty (NEW) With any $50 purchase get a free full size Lip & Cheek Stain in Sarah (a $24 value). Free shipping on any $25 order. Marc Jacobs Beauty (NEW) With any $50 purchase get a free full size Lip Lock Moisture Balm SPF 18 (a $24 value). ONE TIME USE! Receive a FREE FULL-SIZED highliner and FREE SHIPPING with a $50 Purchase at MarcJacobsBeauty.com! Use code: HIGHLINER at checkout. Milani (NEW) Get a Free Kabuki Fan Brush worth $15.99 with Any Bronzer or Highlighter Purchase (starting from $8.99)! Ends 4/14. (NEW) April GWP: Get a Free Amore Matte Metallic Trio with Any $45 Purchase. Ends 4/30. Olivela (NEW) Use code TRYUS to get 10% off your first order including all beauty. Free shipping and free returns on any order. Shop top brands here—every purchase gives back, every day. Pick 3 free samples on any order. Paula’s Choice (NEW) Free 2% BHA Duo ($38 Value) on $75+ with Free Shipping use code EXFOLIATE. (NEW) Use code FAVS4U to get Up to 25% Off Beauty Editor Must-Haves! Peter Thomas Roth (NEW) 50% off Select Sets. (NEW) With any $50 purchase get a 2pc deluxe gift use code: SPRING19, ends 4/30. ReVive (NEW) Enjoy a complimentary 4-piece gift with $350+ purchase in a luxury travel pouch ($178 value). Free shipping on any order and 2 free deluxe samples with any purchase. Sign up to their newsletter and get $25 off your first $250 purchase. Saks Fifth Avenue (NEW) Receive a Thank You Gift With Purchase Bundle of a Re-Nutriv Ultimate Diamond Transformative Energy Face Cream & a Re-Nutriv Ultimate Diamond Transformative Energy Eye Cream* with any $75 Estee Lauder purchase. Use code ESTEE5SF at checkout. (1d) Gift card event including beauty! $35 Gift Card with your $250+ purchase Use the code “APRGC19“at checkout. Sephora and Sephora.ca (NEW) Receive a Pinrose Pouch Set, free with the purchase of select Pinrose fragrances. While supplies last. Shiseido (NEW) Defy Time Bonus! FREE 4 piece Future Solution LX gift ($59 value) with your $150 purchase. Ends 4/21! Sigma Beauty (NEW) offers 30% off Sitewide use coupon code “WELCOME30” + free shipping on any order. SkinStore (NEW) 25% off Sitewide Sale use coupon code “25SALE”. (NEW) Save 20% off your purchase with code: SPRING Plus, receive a FREE Eyeko Fat Eye Stick when you spend $80 or more! Stila Cosmetics (NEW) FREE Mini Stay All Day Liquid Eye Liner with purchase of $30 or more at stilacosmetics.com. No code required. Tarte Cosmetics (NEW) 30% off use code: BESTIES for members (exclusions apply). 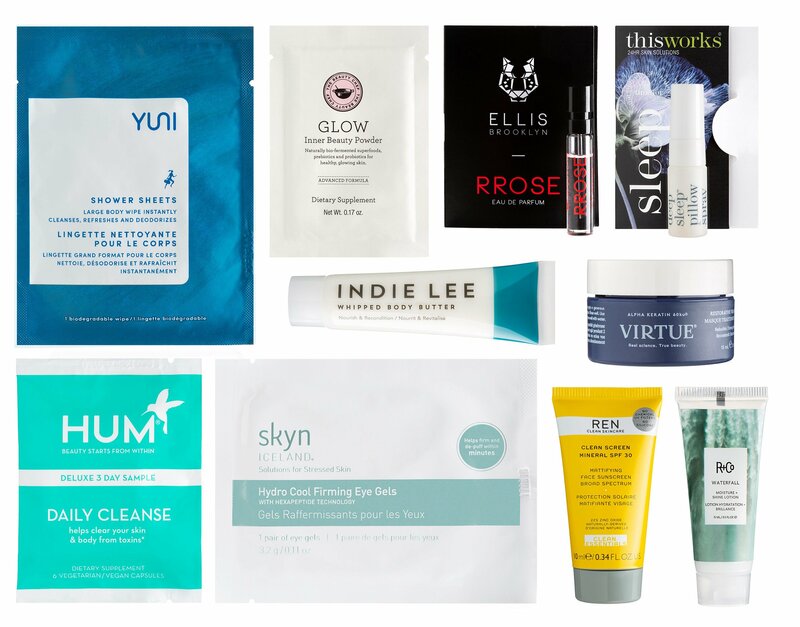 (NEW) Plus, 3 samples at checkout with $100 purchase. Ulta (1d) Receive a FREE 19pc Beauty Bag with any $30 online purchase. A $32 value! Skyn Iceland (NEW)(HOT) Use code CRUELTYFREE to get 30% off sitewide. Free shipping on any $50 order.